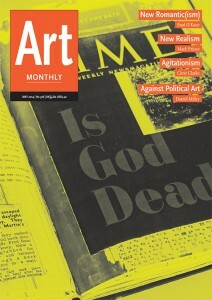 Daniel Miller, Paul O’Kane and Stephen Wilson discuss their features and reviews from the May issue of Art Monthly. Daniel discusses he is Polemic piece entitled Against Political Art, Paul O’kane discusses his feature New Romatic(ism) and Stephen discusses his report on Art Taipei. This entry was posted in Art Monthly Monthly and tagged art monthly, Art Taipei, Charles Baudelaire, Chris McCormack, DANIEL MILLER, Gustave Courbet, Jon Rafman, national portrait gallery, Paul O'Kane, political art, Realsim, Renaissance, Romanticism, STEPHEN WILSON, Taipei on June 16, 2014 by artmonthly.